Perhaps equally or even more important than region or even grade in classifying pu-erh is the method of cultivation. Plantation bushes (guànmù, 灌木; taídì, 台地): Cultivated tea bushes, from the seeds or cuttings of wild tea trees and planted in relatively low altitudes and flatter terrain. The tea produced from these plants are considered inferior due to the use of pesticides and chemical fertilizer in cultivation, and the lack of pleasant flavours, and the presence of harsh bitterness and astringency from the tea. 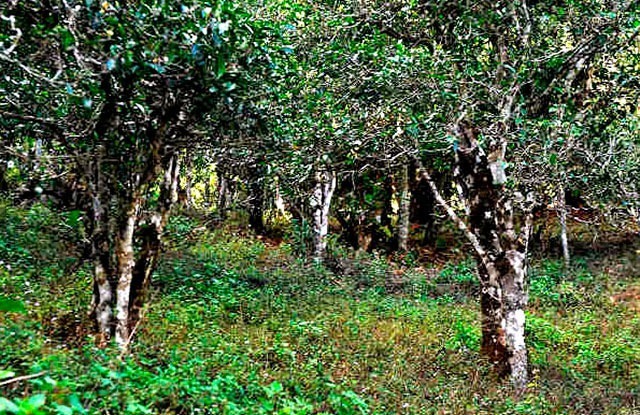 "Wild arbor" trees (yěfàng, 野放): Most producers claim that their pu-erh is from wild trees, but most use leaves from older plantations that were cultivated in previous generations that have gone feral due to the lack of care. These trees produce teas of better flavor due to the higher levels of secondary metabolite produced in the tea tree. As well, the trees are typically cared for using organic practices, which includes the scheduled pruning of the trees in a manner similar to pollarding. Despite the good quality of their produced teas, "wild arbor" trees are not as prized as the truly wild trees. Wild trees (gŭshù, 古树; literally "old tree"): Teas from old wild trees, grown without human intervention, are the highest valued pu-erh teas. Such teas are valued for having deeper and more complex flavors, often with camphor or "mint" notes, said to be imparted by the many camphor trees that grow in the same environment as the wild tea trees. 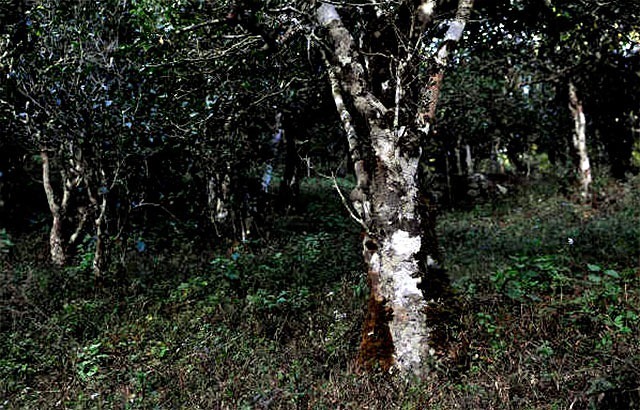 Young raw pu-erh teas produced from the leaf tips of these trees also lack overwhelming astringency and bitterness often attributed to young pu-erh. Determining whether or not a tea is wild is a challenging task, made more difficult through the inconsistent and unclear terminology and labeling in Chinese. Terms like yěshēng (野生; literally "wild" or "uncultivated"), qiáomù (乔木; literally "tall tree"), yěshēng qiáomù (野生乔木; literally "uncultivated trees"), and gǔshù are found on the labels of cakes of both wild and "wild arbor" variety, and on blended cakes, which contain leaves from tea plants of various cultivations. These inconsistent and often misleading labels can easily confuse uninitiated tea buyers regardless of their grasp of the Chinese language. As well, the lack of specific information about tea leaf sources in the printed wrappers and identifiers that come with the pu-erh cake makes identification of the tea a difficult task. Pu-erh journals and similar annual guides such as The Profound World of Chi Tse, Pu-erh Yearbook, and Pu-erh Teapot Magazine contain credible sources for leaf information. Tea factories are generally honest about their leaf sources, but someone without access to tea factory or other information is often at the mercy of the middlemen or an unscrupulous vendor. Many pu-erh aficionados seek out and maintain relationships with vendors who they feel they can trust to help mitigate the issue of finding the "truth" of the leaves. Sadly, even in the best of circumstances, when a journal, factory information, and trustworthy vendor all align to assure a tea's genuinely wild leaf, fakes fill the market and make the issue even more complicated. Because collectors often doubt the reliability of written information, some believe certain physical aspects of the leaf can point to its cultivation. 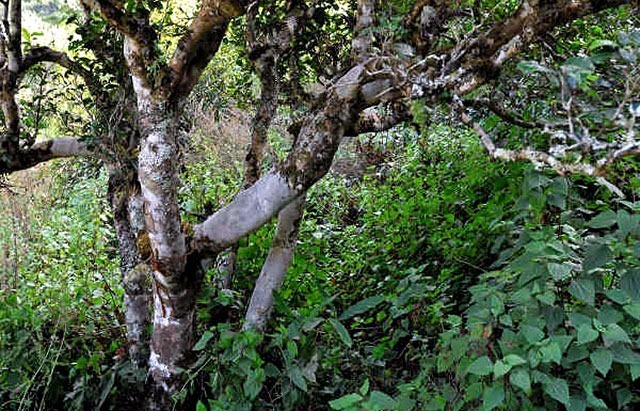 For example, drinkers cite the evidence of a truly wild old tree in a menthol effect ("camphor" in tea specialist terminology) supposedly caused by the Camphor laurel trees that grow amongst wild tea trees in Yunnan's tea forests. As well, the presence of thick veins and saw tooth-edged on the leaves along with camphor flavor elements and taken as signifiers of wild tea.